One of the treasures preserved by the National Library of Medicine (NLM) is a 1945 US Navy training film directed by and starring Gene Kelly, who was then a rising Hollywood star. Combat Fatigue Irritability is a historically significant, yet largely unknown, work. Now, NLM’s History of Medicine Division (HMD) is making the film available to a wide audience, with supplementary materials from NLM historians, including a unique interview with Kelly’s daughter, Kerry Kelly Novick. Novick, a developmental psychoanalyst who studied under Anna Freud, was a guest speaker during NLM’s February Board of Regents meeting. The History of Medicine Division has added both her talk and her interview to its Medical Movies on the Web portal. The site features a full-length version of Combat Fatigue Irritability. Along with the film is a valuable research tool, a searchable transcript, plus written commentary by NLM historian Michael Sappol, PhD. 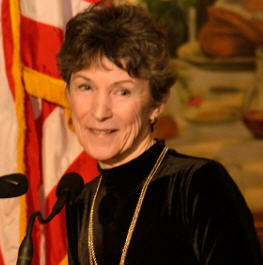 Speaking as a daughter and a mental health professional, Novick talked about her father and messages in the film that are still relevant for service men and women and their families. “When my father joined the Navy in World War II, our lives changed as they did for so many other families,” Novick said. She and her mother moved east and lived with her grandmother to be closer to Kelly. He was stationed in Anacostia, an area of Washington, DC, making training films for the Navy’s photographic unit. 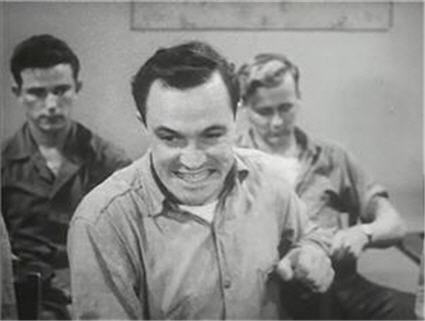 Combat Fatigue Irritability focuses on Kelly’s character, Seaman Bob Lucas, whose ship is torpedoed and sunk. He’s in a military hospital, trying to understand why he’s angry, on edge, and unable to get along with people the way he once did. The force of wanting to learn more, Novick said, is something she learned from her father and that he demonstrated in making the film—he prepared by having himself admitted to military psychiatric hospitals. Novick said there is a “culture-wide tendency to view emotional, psychological or mental troubles as weakness or failure” and diagnostic labels like “PTSD” or “shell shock” may make veterans reluctant to seek help. “A strength of this film is that is gives us a single sailor to focus on, reminding us perhaps that considering each person’s individual story is at least as important as the diagnosis,” she said. “These are wounds to the soul, the effects of having done something that conflicts with the moral code that a person was raised in, or from the feeling of guilt for having failed to do something, again violating their moral code,” she explained. While Novick looked back at the film, she also looked ahead and said there’s hope that we can do better in taking care of veterans and their families. She discussed the range of psychotherapeutic treatment methods in the Veterans’ Administration system and the research efforts of the National Institutes of Health and its National Institute of Mental Health. “Mental health parity puts all aspects of care on equal footing, acknowledging also the interconnectedness of emotional and physical health,” she said. She also acknowledged in the importance of preserving history, acknowledging NLM’s efforts and noting that her father had a lifetime interest in history, particularly American history. 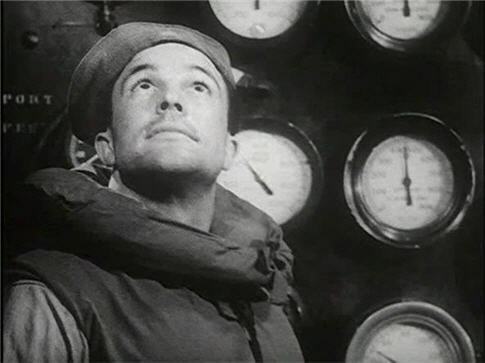 Gene Kelly’s character, Seaman Bob Lucas, ends up in a military hospital, trying to understand why he’s angry and on edge following the sinking of the naval ship he was on. Combat Fatigue Irritability was released in 1945. It was restricted to military viewing and likely seen only by men in military facilities and the health professionals treating them, as Michael Sappol notes in a post on HMD’s blog, Circulating Now. After the war, in 1955, the Navy donated a copy of the 16mm film to NLM. The film didn’t get much attention for decades. NLM brought it out of the vault and onto the Web in 2010 when it launched its Digital Collections repository, and later made it a feature on Medical Movies on the Web. In addition to its place on Medical Movies on the Web, excerpts from the interview are posted on Circulating Now. March 14, 2014 in Collections, Products.